Relief Defendant - What Does It Mean? What is the definition of the term "relief defendant"? What does the term "relief defendant" mean? A "relief defendant" is a person who has illegally obtained property but is not accused of any sort of wrongdoing. 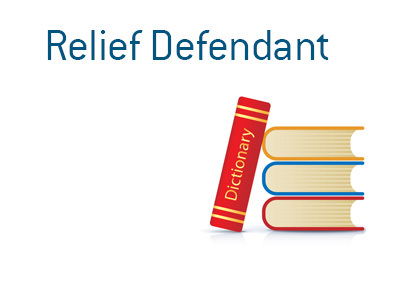 The term "relief defendant" is used in civil litigation cases. Let's look at an example of when somebody might be considered a "relief defendant". One of your best friends gives you a stock tip and advises you to buy as many shares of the company as you possibly can. Your friend is very successful and somebody that you trust implicitly, so you follow their advice. A few weeks later, the company gets purchased in cash for a 40% premium. You thank your friend for the prescient tip and take them out for a nice lunch. A year or so later, your friend is charged with insider trading. It turns out that your friend received insider information that the company was about to be purchased and, in turn, passed this information onto you. The SEC, in their complaint, names you as a "relief defendant" and asks you to disgorge your profit. You feel as though you did nothing wrong, as you didn't knowingly trade using insider information. The fact remains, however, that you profited from insider information, despite the fact that you didn't do so knowingly. After some negotiation with the SEC, your lawyer informs you that you will need to pay the full profit that you made to the SEC, in addition to a small amount of interest. Again - you obtained your profits via insider information, but you were unaware of the situation and were not being accused of any wrongdoing. The illegally obtained property (in this case, the profits), will have to be returned to the government.